The Remington Portable first appeared in the market in 1920. It was not the first-ever portable, for the Blickensderfer and the Standard had already appeared on the market, but it was the first portable to use a 4-bank standard keyboard as well as other principal features of the office machines. The Remington Portable has a unique method of raising the typebars to a printing position by means of a lever on the right side of the typewriter. The production of the Remington Portable lasted more than 8 years, with continual improvements to the design. Early Remington Portable have a single shift key on the left side, whereas the later versions have shift keys on both sides of the keyboard. 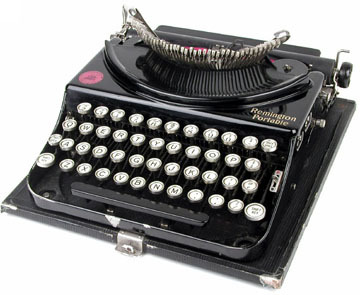 Because of this variation, many collectors refer to the early machines with the left shift key only as the Remington Portable No.1, and the rest as the No.2. Later versions also appeared in several duotone colors.